Make these with the kids. Preheat your oven to 350 degrees. In a mixing bowl cream together the butter and sugars until fluffy. Beat in the vanilla. With a wooden spoon, stir in the almonds and chips. Add the flour, then with your hands, knead the dough until the flour is incorporated. 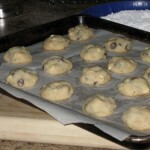 Roll into 1-inch balls and place on ungreased (or parchment lined) cookie sheets. Bake for 15 minutes. Cool them on the baking sheets for about 5 minutes. Put the 2 cups of confectioners’ sugar in a bowl or pie plate. 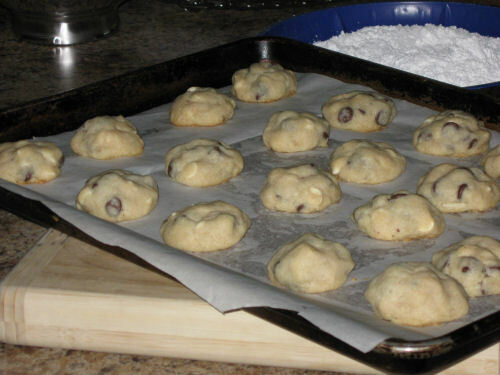 Remove cookies from baking sheets then roll in confectioners’ sugar. Cool completely.